Nikon | Semiconductor Lithography Systems | 1. What is a semiconductor, a device that's so small, yet so essential to everyday life? Home > Products & Solutions > Semiconductor Lithography Systems > Semiconductor Technology > 1. What is a semiconductor, a device that's so small, yet so essential to everyday life? 1. What is a semiconductor, a device that's so small, yet so essential to everyday life? 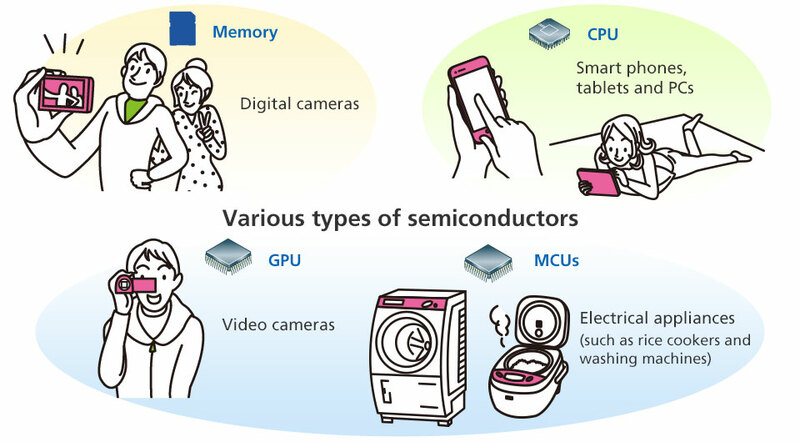 The term semiconductor is an abbreviated expression for a semiconductor integrated circuit, or computer chip. Semiconductors have many billions of elements (transistors, resistors, capacitors, diodes), all of which constitute an electrical circuit. These elements are arranged on a chip made of silicon—a semiconductor material that passes and stops electrical current. In today's digital society, electronic devices such as smartphones, tablets and personal computers, and electrical appliances such as rice cookers and washing machines that have microprocessors in them, have become a part of our daily life. Semiconductors are the brains of these devices. Semiconductors are indispensable to making many types of electronic devices and electrical appliances work efficiently. Tiny semiconductors work behind the scenes to keep our rooms at comfortable temperatures, microwave our food so it's just right, and make it easy for us to take beautiful digital photos at the push of a button. Our digital society is supported in a significant way by highly integrated semiconductors.